We are offering two free National Mall tours on May 30th and 31st as part of the WalkingTown DC program with Cultural Tourism DC. No reservations are required. We’ll meet at 1 p.m. at the Jefferson Memorial and end at 2:30pm at the FDR Memorial. Handouts and self-guided tour brochures will be provided. WalkingTown DC Spring Edition 2009 includes many, many tours all over the City. Look through the offerings here. 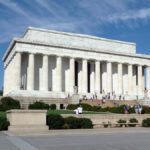 This tour of the Jefferson, George Mason, and FDR memorials may surprise those who think they know the iconic monuments. Inscriptions and sculptures tell a powerful story but so do partial quotations and historical omissions. This tour is part of the National Mall Conservancy’s new self-guided tour, America’s Struggle for Freedom. Led by Judy Scott Feldman, President of the National Coalition to Save Our Mall, on behalf of our educational offshoot, the nonprofit National Mall Conservancy.